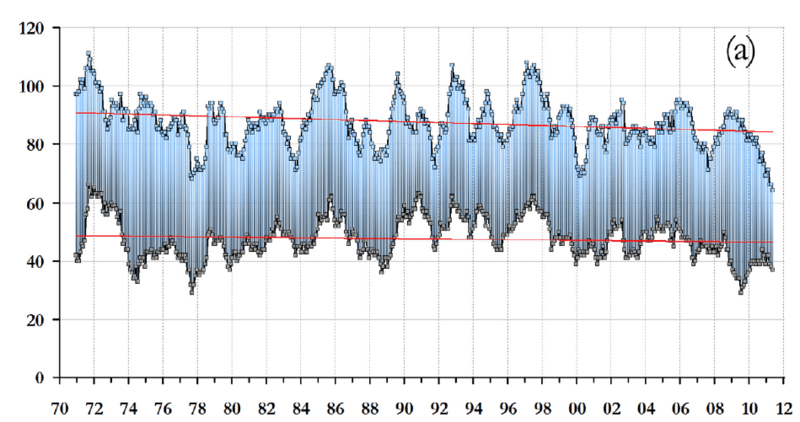 Summary: When did normal weather become exceptional? Hurricane Sandy tells us much about our climate, weather — and ourselves. The truth is out there, if only we wished to see it. If you find this useful, please pass it on to others! Nothing “historic” in these numbers. Click here to get the most current report. Click here to see the forecasted path. Are they becoming more frequent, more extreme? Also see updates and additional information in the comments, including a video of the 1938 superstorm that hit NYC. “New York City began precautions for an ominous but still uncertain forecast. … Jeff Masters, meteorology director of the forecasting service Weather Underground, said this could be as big, perhaps bigger, than the worst East Coast storm on record, a 1938 New England hurricane that is sometimes known as the Long Island Express, which killed nearly 800 people. Computer models predict Delaware, Maryland and Virginia could see up to a foot of rain, according to the CNN Weather Unit. Isolated spots could see the worst rains in 500 years. … Sandy presents a scenario not unlike the one that led to 1991’s “Perfect Storm,” when moisture flung north by Hurricane Grace combined with a high pressure system and a cold front to produce a tempest in the north Atlantic over Halloween. But Grace never made landfall. Sandy could have severe effects, as described by the forecasts of the National Weather Service’s Public Advisory and forecast of their Hydrometeorological Prediction Center. The AP — and most news stories about Sandy — do not mention the key factor that might cause large property losses: during the past 0 years we’ve built massive urban complexes with inadequate attention to normal weather effects. Some of this development is mad — such as construction in floodplains and barrier islands (much of which occurs only due to the subsidies of the Federal Flood Insurance program and disaster relief programs). New Orleans — near the ocean, in a major storm area, and below sea level. The result is increasing property damage and disruption of vital infrastructure — although less loss of life, as our infrastructure improves in quality and resilience. The news media reflect the structure of our society. Their biases combine to happy commercial effect: chronic disasterphilia, love of the “extreme climate” narrative, and reluctance to blame our corporate rulers. The missing words from almost every news story: “this during this current period of record low global hurricane activity”. See the next section for details. (3) Are hurricanes becoming more frequent, more extreme? We’re in a period of low activity, although you’d not learn that from the US news media. (a) “Tropical cyclones and climate change“, Thomas R. Knutson et al, Nature Geoscience, March 2010 — Ungated copy here. Similar conclusions to the following two. It is still a fundamental research question as to what are the atmosphere and ocean mechanisms responsible for the observed annual global TC frequency of ∼87 storms. With the upcoming IPCC AR5 assessment and associated CMIP5 climate simulations, it is critical to have the best possible diagnosis of periods of global TC inactivity and incorporate the recent pentad of historical lows into the context of natural and anthropogenically forced climate variability. Furthermore, research must better explain the role of tropical cyclones in the climate system especially during this current period of record inactivity. Global tropical cyclone Accumulated Cyclone Energy (ACE units 104 knots2), annual totals from 1970–2011. Global tropical cyclone frequency, monthly from 1970–2011: 12‐month running sums including all TCs (top time series), and only hurricane force TCs (bottom time series). From currently available historical tropical cyclone (TC) records, we constructed a long-period global hurricane landfall dataset using a consistent methodology. 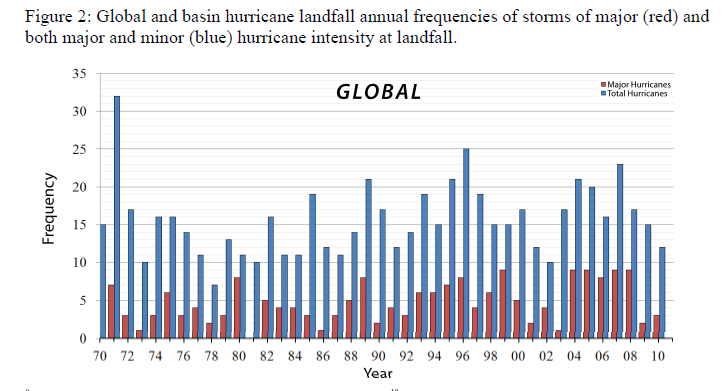 We have identified considerable interannual variability in the frequency of global hurricane landfalls, but within the resolution of the available data, our evidence does not support the presence of significant long-period global or individual basin linear trends for minor, major, or total hurricanes within the period(s) covered by the available quality data. Therefore, our long-period analysis does not support claims that increasing TC landfall frequency or landfall intensity has contributed to concomitantly increasing economic losses. Due to documented multidecadal variations in TC frequency and intensity on global and basin scales, our findings strongly support the usage of long-period historical landfall datasets for trend analysis. While there is continued uncertainty surrounding future changes in climate, current projections of TC frequency or intensity change may not yield an anthropogenic signal in economic loss data for many decades or even centuries. Thus, our quantitative analysis of global hurricane landfalls is consistent with previous research focused on normalized losses associated with hurricanes that have found no trends once data is properly adjusted for societal factors. Despite the hysteria about Sandy being “the worst”, there have been many horrific hurricanes in US history. Fortunately most when our population density was lower, our cities far smaller. (a) Sandy might resemble Hurricane Hazel of 1954. See the NWS history page; and their detailed description here. Hat tip on this to Brad Johnson at WUWT. The hurricane was a major event. All six front-page columns of the August 25, 1893, New York Times were dedicated to the “unexampled fury” of the “West Indian monster.” The storm sunk dozens of boats and killed scores of sailors. In Central Park, hundreds of trees were uprooted, … a 30-foot storm surge swept across southern Brooklyn and Queens, destroying virtually every man-made structure in its path. 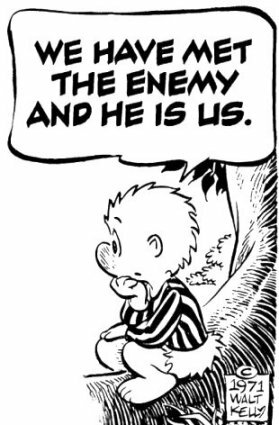 From a 1970 poster made for the first Earth Day by Walt Kelly. Previous Post Today’s open thread about the death of the Constitution. Tell us your story. The ICAT Damage Estimator can be used to obtain statistics regarding historic storms that have followed similar paths to Hurricane Sandy’s current forecast path. For this analysis, the Active Storms search feature was used to select all historic storms that have made landfall within the current range of computer model forecasts. This range includes the coastline from near the MD/VA border on the DelMarVa Peninsula to the eastern edge of Long Island, NY. The ICAT Damage Estimator shows that there have been 7 damaging tropical cyclones that have made landfall along this segment of coastline since 1900. The tool shows the storm parameters, the damage at the time of landfall, and the estimated damage if the storms were to make landfall in 2012. The 2012 damage estimations are made by “normalizing” the data by adjusting for population change, inflation, and change in wealth per capita. The most damaging storm to make landfall within the current range of computer model forecasts was the New England hurricane of 1938, which would cause an estimated ~$47B in damage today. However, this storm was a category 3 hurricane when it made landfall, while Sandy is only expected to have category 1 force winds. Of the 7 storms selected, only two made landfall as category 1 hurricanes. Hurricane Agnes of 1972 made landfall with 85 mph sustained winds near New York City and would cause an estimated $19B in damage today. Agnes initially made landfall over the FL Panhandle, then moved NE and emerged off the NC coast. As it approached New England, the storm strengthened as it underwent extratropical transition, which is also expected to occur with Hurricane Sandy. Hurricane Agnes’s impacts were felt across a very wide area of the Northeast. Hurricane Belle of 1976 also had 85 mph winds, but moved much more quickly than Agnes and was weakening as it made landfall. It is estimated that Belle would cause less than $1B in damage today. As can be seen from the storms selected by the ICAT Damage Estimator, the sample size of category 1 hurricanes making landfall along the Northeast is not very large. While Agnes appears to be the most similar to Sandy, it made landfall near New York City, which explains why the damage estimates are so high. Hurricane Irene of 2011 officially made landfall further south, but impacted a similar area that will be affected by Hurricane Sandy. That storm caused ~$7B in damage, but was not quite as strong as Sandy is expected to be. 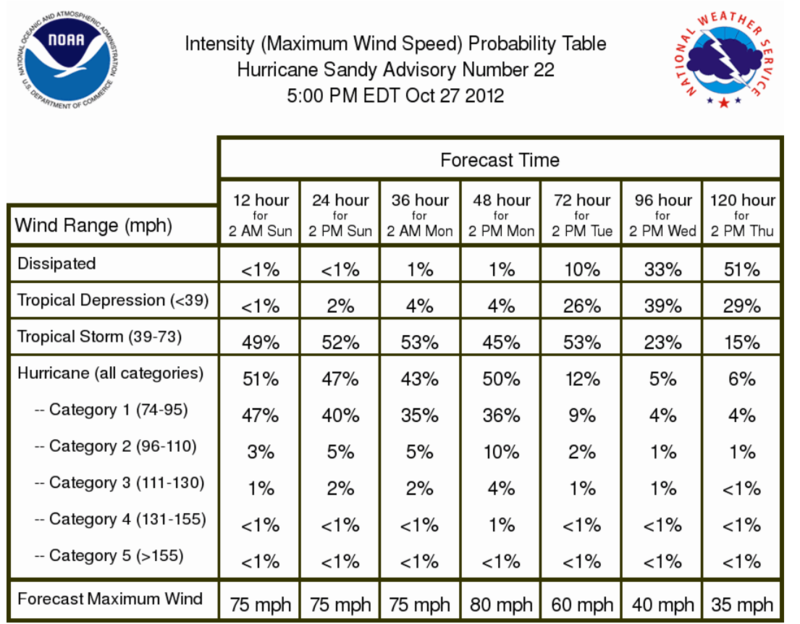 This data can be used as a benchmark to assess the range of possibilities for Sandy’s impact. The image below is output from the ICAT Damage Estimator, which shows the range of computer model forecasts and the historic storms that have made landfall within that range. Hurricane Agnes is highlighted in orange. The histogram shows normalized damage statistics for the 7 selected storms. The United States is facing a year or more without crucial satellites that provide invaluable data for predicting storm tracks, a result of years of mismanagement, lack of financing and delays in launching replacements, according to several recent official reviews. The looming gap in satellite coverage, which some experts view as almost certain within the next few years, could result in shaky forecasts about storms like Hurricane Sandy, which is expected to hit the East Coast early next week. The endangered satellites fly pole-to-pole orbits and cross the Equator in the afternoon, scanning the entire planet one strip at a time. Along with orbiters on other timetables, they are among the most effective tools used to pin down the paths of major storms about five days ahead. … Experts have grown increasingly alarmed in the past two years because the existing polar satellites are nearing or beyond their life expectancies, and the launch of the next replacement, known as J.P.S.S.-1, has slipped to 2017, probably too late to avoid a coverage gap of at least a year. Prodded by lawmakers and auditors, the satellite program’s managers are just beginning to think through alternatives when the gap occurs, but these are unlikely to avoid it. The Government Accountability Office, which views a gap as “almost certain,” has been urging NOAA to come up with alternatives, like leaning on other commercial, military or government satellites for helpful data. But it said it would take a long time and more money to get any such jury-rigged system running. For now, the agency is running on a stopgap bill that allows it to redirect money from other projects to the polar satellites. In approving it, Congress demanded a plan by next week showing how NOAA intended to stay on schedule and within a strict limit — about $900 million a year. … The program’s problems began a decade ago with an effort to merge military and civilian weather satellites into a single project. After its cost doubled and its schedule slipped five years, that project was sundered by the Obama administration. As its existing satellites aged and the delays mounted, NOAA finally put a new model named Suomi into orbit a year ago that now helps bridge the gap until the next launchings, in 2017 and in 2022 — two and four years late, respectively. But there are lingering concerns that technical glitches have shortened Suomi’s useful lifetime, perhaps to just three years. Predicting a satellite’s lifetime is like trying to guess when a light bulb will go out. The most likely timing of a gap in coverage is between 2016 and 2018, according to the best official estimates. Maybe part of the problem is that people have invested a lot of money in weather reporting, and they need to make it sound important for the purpose of advertising puffery. I remember the local eyewitness action center news weather center or whatever they called it some years back running an ad for their weather report calling it “your first line of defense”. NORAD watching for Russian bombers during the Cubam Missile Crisis was entitled to that sort of dramatic claim, but not the local weather guy. Or girl, I don’t remember which it was at the time. Or maybe we just have an inherent ingrained need to worry, even though compared to our caveman ancestors we’re pretty secure. Sheppard goes to the heart of a serious problem. We are dependent on scientists (broadly defined to include engineers and technicans) to warn us of natural disasters — esp those which can damage cities, destroy cities, or even wipe away our civilization. Unfortunately (in one sense) these are rare. How do they justify their existance during the long wait? It takes great professional self-discipline to resist the tendency towards threat inflation and over-dramatization. But that kind of organizational (ie, group or collective) self-discipline is an ability we seem to have lost. Even in the cases where the scientists attempt to accurately inform the public of the potential risks, the media will misrepresent the story, given their lack of expertise in the relevant area and lack of general scientific knowledge. Combine it with the media’s desire to grab eyeballs and stories that were “Something bad might happen, but probably won’t” become “Something bad could happen, what they don’t want you to know”. I agree! But the news media has always been notorious — probably worse than today’s — in this respect. But my impression (which could be wrong) is that in the past there was more professional discipline by scientists (broadly defined) than today. Now we have scientists making outlandish statements — far outside anything defensible with the literature — in front of the TV cameras. Attention-whores, who displace more sober (less exciting) experts. … And as millions of Americans across the East Coast hunker down, some are turning to history as a guide. In 1938, for instance, a category 3 hurricane left 600 people dead in New England. During that ferocious hurricane, also known as the Yankee Clipper and the Long Island Express, the Empire State Building reportedly swayed with wind gusts, and 60 people in New York City alone were killed, says Oren Yaniv at the New York Daily News. No stiff upper lips in the US news media. Coverage of Sandy is hysteria on stilts. “NYC subways are flooded!” It’s a “reverse Titanic” as the water “covers everything”. Like after Katrina (which was in fact horrific), we’ll probably find the damage repaired far faster than the news hounds led us to expect. I was in the San Francisco Bay Area for a conference during the the Loma Prieta earthquake, and an hour afterwards drove near the epicenter while listening to the radio. Little damage could be seen. But on the radio! My favorite was one reporters prediction that soon the starving hordes would be moving across the Bay area like locusts in search of food. The coverage was hysterical (in both senses, to us). Afterwards these journalists gave themselves awards for their coverage. No matter what the science, activists use Hurrican Sandy as propaganda. They just “know” it was caused by global warming, and don’t care what scientists say.